This presumption holds even at the most critical pole of the debate on Gaza. The Israeli human rights group B’Tselemcondemned as “illegal” Israel’s resort to lethal force against unarmed persons “approaching the fence, damaging it, or attempting to cross it.” But it conceded that “[o]bviously, the military is allowed to prevent such actions, and even to detain individuals attempting to carry them out.” A senior Human Rights Watch official argued that Israel’s use of live ammunition in Gaza was “unlawful.” But she suggested that “nonlethal means, such as tear gas, skunk water, and rubber-coated steel pellets” would have passed legal muster. The International Committee of the Red Cross cautioned Israel that “lethal force only be used as a last resort and when strictly unavoidable in order to protect life.” Even the major Palestinian human rights organizations characterized Israel’s use of force as “excessive,” “indiscriminate,” and “disproportionate” rather than inherently illegal. To justify its use of force in Gaza, Israel claims the right to prevent alien intrusion into its sovereign territory. An Israeli legal commentator observesthat this professed concern for the sanctity of the Gaza “border” is opportunistically selective. 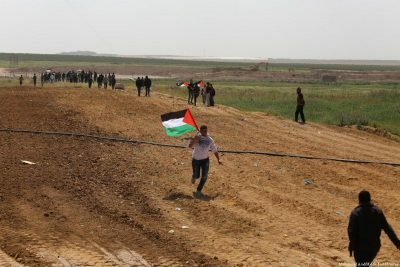 Israel invades Gaza at will; only when Palestinians seek to cross in the other direction does the fence become sacrosanct. Setting this hypocrisy aside, Israel’s purported right to self-defense still lacks any legal basis. On the contrary, Israel’s resort to force contravenes international law.